SOLD BY FLYING FISH PROPERTIES Just a short walk from High Brooms mainline station is this fantastic two-bedroom house. It is generously sized with neutral and immaculate décor throughout and is set back from the road by a paved off street parking area. On entering the house the living/dining room is immediately on your right. It is plenty big enough for large comfortable sofas and a dining table and chairs. It is the perfect space for family living and entertaining with access at the rear through to the separate smart modern kitchen. The kitchen has lots of work top space and a good selection of cupboards both top and bottom. With a fitted electric oven, 4 ring electric hob and extractor and space and plumbing for freestanding appliances it has everything you need for a wonderful cooking experience. Climbing the stairs to the first floor the bathroom is on your left of the landing. It has a modern suite with a shower over the bath, its window reflecting light off its white fittings and contemporary tiles creating a soothing bathing experience. There are two good sized bedrooms both of which have large windows bring in lots of natural light with the main bedroom having a useful open floor to ceiling shelf unit in the alcove. Outside to the rear is an enclosed garden laid mainly to lawn with a paved terrace area perfect for a table and chairs. It benefits from front street access and a lockable shed for storage. 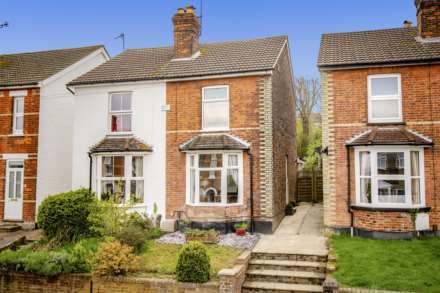 This home has been modernised and well maintained throughout and is a perfect for a young family or professionals due to its fantastic location. A must see! Cloakroom: opaque double glazed rear aspect window, low level WC with part tiled wall behind, wall mounted hand wash basin and tile effect laminate floor. Bathroom: double glazed opaque rear aspect window, tiled walls, tile effect laminate floor, panel enclosed bath with wall mounted shower, pedestal wash basin, low level WC and heated towel rail. Bedroom 1: 12" x 10`11" double glazed front aspect window, open recess storage cupboard with hanging rail and radiator. Bedroom 2: 9`9 x 8`11" double glazed rear aspect window and radiator. 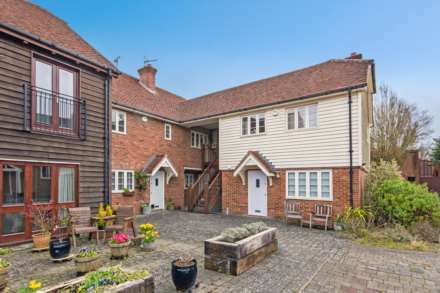 Outside: to the front of the property is a flagstone off street parking space fronting a brick wall with wooden trellising over and brick arch with inset wrought iron gate giving access to the rear garden. A stone pathway leads up to the front door and wraps in front of the living room fronting an area of lawn that lies behind the low-level brick wall to the front. At the rear, there is a further area of flagstone terrace in front of the garden laid mainly to lawn with wooden perimeter fencing and brick walls on all sides. A covered bin storage area and a metal shed provide additional storage with some low maintenance shrubs and trees sitting at the boundaries.